The AFG Sport 5.5AE is a lighter elliptical trainer than the AFG Sport 5.9AE that we’ve already presented here. 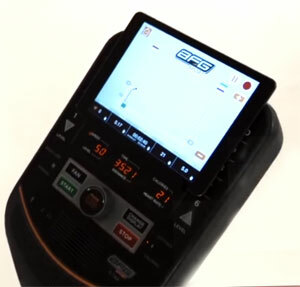 As opposed to the 5.9AE model, this one does not have an incline system and Bluetooth connectivity. But nonetheless, it basically offers the same preset program base and has considerably more features than a basic model. The AFG Sport 5.5AE has a frame construction that can be compared to the Schwinn 430. Needless to say, the machine’s main structural frame is made of steel. Its pedals and front crank system are rated for a maximum user weight capacity of 275 lbs (125 kg), which is not bad for a machine designed for home use. The unit also has several non-metallic parts. Among them, we can count the front covers of the motor, flywheel and resistance system, the rear base cover, the casing of the console, and the pedals. The bases of the pedals are metallic, though; thus, despite the fact that their top elements are made of ABS, they should be able to withstand users up to the specified 275 lbs (125 kg) weight capacity with no problem. All the metallic parts in the unit’s frame construction are double-coated with a gray paint finish which is resistant to abrasion and corrosion. Gray is the only color available for this unit. The fully assembled unit is fairly large. It’s approx. 74″ (188 cm) long, and 24″ (61 cm) wide. This being said, it’s recommended to assign a usage area for it of at least 110″ x 60″ (280 x 152 cm). It is also considerably heavy. Its net weight is approx. 172 lbs (78 kg), so it definitely requires two people for transport and assembly. But on the other hand, all this weight provides an outstanding stability for the unit. You can be sure it won’t rock or tip over even if you engage in a highly demanding cardio workout. Plus, its center base and its rear base are equipped with adjustable levelers which have rubber pads, allowing you to perfectly stabilize the unit on any type of floor. Due to its weight, it’s recommended, though, to place it and use it on a rubberized mat. Despite its weight, once the unit is fully set up, moving it shouldn’t be too difficult. Its front base is equipped with transport wheels which facilitate its relocation. By using the front wheels to move the machine, you will only be handling 1/3 of its total weight. This AFG Sport elliptical trainer is equipped with two sets of handlebars. One is fixed and directly attached to the front mast. Its grips incorporate stainless steel pulse sensors, so by holding on to them when exercising, the console can monitor your pulse. The other handlebars are mobile and connected to the pedal base. This being said, they continue to move for as long as you pedal; the cannot be locked. They feature long, curved grips with a layer of rubber-foam material for optimal comfort. The main joints of the machine integrate high-grade ball bearings. Therefore, the movement of the main arms and pedals is smooth, and squeaking is less likely to occur, especially if you lubricate the joints during the assembly. 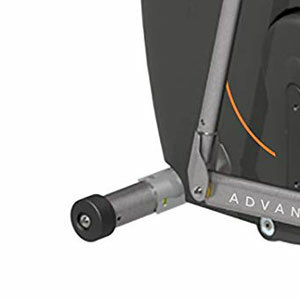 Just as the AFG Sport 5.7AE, this elliptical trainer model does not have an incline system. Also, as opposed to the 5.7AE, its stride is a bit shorter. It measures approx. 18″ (46 cm) long, which means that the unit should be able to accommodate users up to 6’2″ (188 cm) comfortably, promoting a satisfying stride and a healthy leg extension for them. Of course, the machine can also be used by taller persons, but in this case, they will have to exercise with a stride length below their maximum range of motion. Evidently, the machine’s stride length is non-adjustable. The machine’s exact Q-Factor (spacing between the pedals) is not specified. However, they are pretty close together promoting a natural foot positioning during exercising, which eliminates any lateral stress on the joints. Even though the machine features a front drive system, its elliptical path is horizontal. The pedals don’t have any cushioning or articulation, such as the ProForm Endurance 920 E, for example. However, extra pedal cushioning isn’t entirely necessary; that’s because most elliptical trainers with this type of construction provide a very low impact workout, and this AFG elliptical makes no exception. The pedals are fairly large; they can accommodate athletic shoes of all sizes. Their surface is ribbed to improve adherence. They also have a front border and side borders to prevent foot slippage during the workout. At their lowest position, the pedals are approx. 10″ above floor level. Conversely, at their highest point, their elevation is approx. 15″ (38 cm). This being said, it’s recommended to use the machine in a room with a ceiling that is at least 20″ (51 cm) higher than your own height. 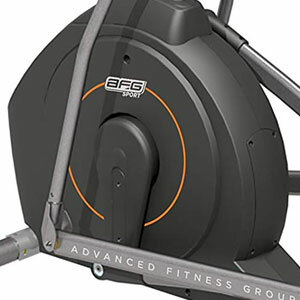 The AFG Sport 5.5AE is a front drive elliptical trainer equipped with a 14.3 (6.5 kg) flywheel. This is a mid-range steel flywheel; most of its weight is placed in its perimeter. Therefore, it delivers a very smooth pedaling motion and a fairly consistent momentum. In case you’re wondering, the flywheel allows reverse pedaling. Of course, when pedaling in reverse you benefit from the same resistance. Also, the console continues to measure your workout metrics based on the rotations of the flywheel. The internal transmission of this elliptical machine is belt-based. The machine integrates a durable rubber belt. This being said, the usage of the machine is almost completely silent. Also, the transmission does not require lubrication. So, unless severe internal damage occurs due to various reasons, you won’t have to worry about opening the drive system casing. 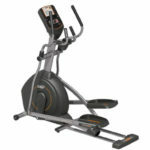 This Advanced Fitness Group elliptical trainer is equipped with a motorized magnetic (eddy current) resistance system. This being said, its resistance system involves a small internal motor and a magnetic brake, while the machine needs to be connected to a power source. A power cord with a U.S. standard 3-prong plug is included with the machine. The connector for the power cord is placed just above the front base of the machine. Since the machine’s resistance system is motorized, the resistance control can only be done from the console. There are 10 resistance levels available. The console is equipped with a gradual adjustment controls but also with quick selection resistance controls from 1 to 10. Also, since the resistance system is automatic, some of the workout programs auto-adjust the resistance of the machine when in use. The AFG 5.5AE elliptical trainer is equipped with a programmable console featuring a LED-based display. Its tracks all the important workout metrics including time, distance, speed, calories, pulse, and also indicates the selected resistance level. The speed is shown in miles per hour, while distance is shown in miles. There is no metric option for these workout metrics. Also, the console can only track your heart rate through the sensors integrated into the stationary handlebars. It does not work with ANT+ or Polar HR transmitters. The console unit does not have Bluetooth connectivity, nor it is compatible with any online fitness apps. However, it has 5 main workout programs, some of them featuring multiple levels of difficulty or multiple variations. The first one is the Manual program which gives you the possibility to freely exercise while manually adjusting the resistance during your workout as you like. The second program is an Interval Program. For this program, the resistance changes and the segments repeat 30 seconds and 90 seconds. This program has 10 levels of difficulty. The 3rd program is a Weight Loss Program, designed specifically to target fat. It’s basically an interval program as well, but its segments repeat every 60 seconds. This also has 10 levels of difficulty. The 4th and 5th programs are Target – Distance and Target – Calories. For Distance, you can choose targets between 1 mile and full marathon. For calories, you can choose targets between 100 calories and 900 calories. The console integrates several amenities as well. First of all, it has its own integrated sound system which consists of two small speakers placed at the bottom of the unit. There is an audio jack in and an earplug connector on top of the unit. Therefore, you can connect your phone, tablet or MP3 player to the console and play your music through the integrated speakers. As small cooling fan is also included. It’s placed just above the speakers. It doesn’t have multiple speed settings, just On/Off. And finally, there is a tablet compartment placed above the LED display of the console. You can place your phone or tablet here in order to view your favorite streams while exercising. However, the unit does not have a USB charging port, nor it can communicate with your tablet. The drive and resistance elements of the machine are already assembled, covered by the ABS shrouds and connected to the front base frame. However, most of the other parts do require assembly. As a general idea, you will have to attach the front base, and the rail assembly to the front part of the frame, then connect the console mast, the pedals, the moving arms, and the console. This may take up to two hours. The manual provides very clear assembly instructions, though, and all the tools required for the assembly are included. For maintenance, it’s recommended to keep the machine’s rails clean; any small objects or textile fibers placed on them can cause damage to the wheels. The unit’s joints may require periodic lubrication. Other than this, you should periodically inspect the unit for loose or broken parts. 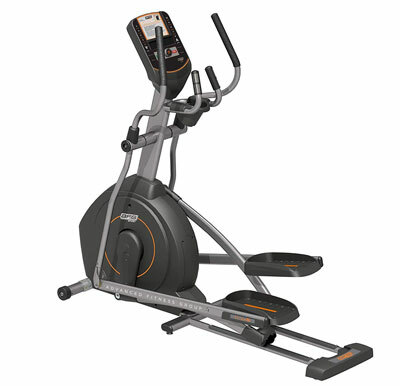 The AFG Sport 5.5AE is a mid-range elliptical trainer designed for home use. 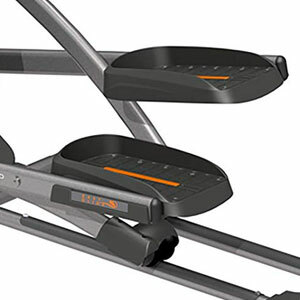 It features a sturdy frame, a 10-level eddy current resistance system, and a console with several workout application. It’s an excellent machine for mid-range and even high-intensity cardio workouts, great for losing weight, toning muscles, building or regaining stamina, and interval-based workouts. It’s not exactly one of the most affordable machines, but it still is considerably cheaper than a light commercial model. In all, it offers a decent overall price/quality ratio.